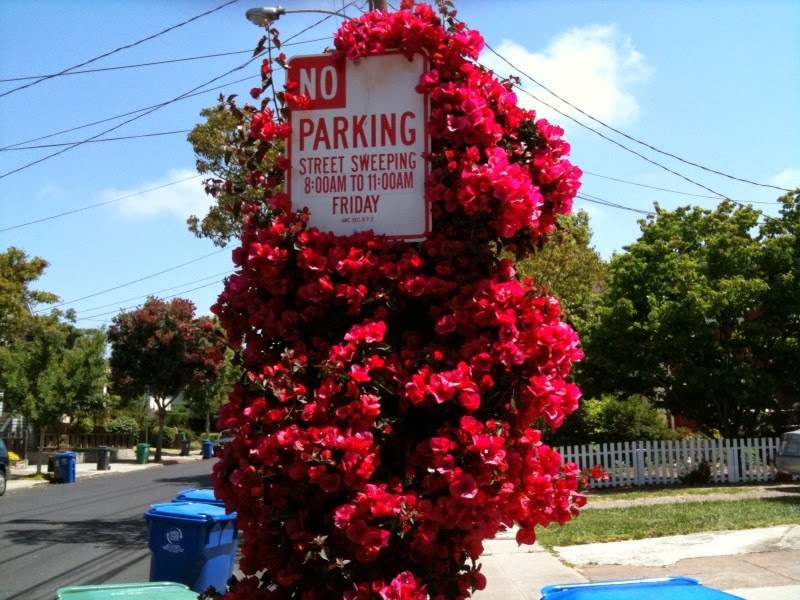 What if all our “NO PARKING” signs were surrounded by flowers (in this instance bougainvilleas)? my version of life may be different than your’s…or not! Bring your own chairs and blankets and dress appropriately for the weather. Food, snacks and beverages available for purchase that evening. No BBQ grills, pets or alcoholic beverages allowed..
And this weekend is the Park Street Wine and Art Fair! The Sun Kings play on Sat only 4-6pm. Alameda Real Estate this Week! I closed two listings since last Friday…. Broker Tour Tues! 15 this week! Saw 10 properties on Tues! Pending listings this week 66 is there a shift coming on? Alameda Real Estate Awards this Week! remember this is only my perspective! Classic Mid-Century Modern single level, close to shopping – hey everything is close in Alameda. Have fun this weekend…lots going on if you are in town! Should be warm and nice this weekend! Enjoy! Call me if you have Alameda real estate questions…or if you are thinking about a different area…I may be able to refer you to a great agent! 3 bdrm, 1.5 bath townhouse, 2 levels, attached 2 car garage. 2 bedrooms, 2. baths, single level condo, laundry in unit, deeded parking space in garage, 16 units in complex. List price (original ) $799,000. Price reduction to 769K. 1 car garage & assigned dedicated space for another car. 2 bedrooms, 2 bath condo, ground level! 3 bedroom, 1.5 baths, detached single family home. 2047 Lincoln Ave. 1/1 w/ detached garage & plus space! Totally redone after decades of being ignored! Single level, with detached garage and plus space in the yard! NO HOA! Seller put in 250K worth of upgrades. 2634 sf, loads of light, high ceilings, built in 1988! 3 bdrms, 2 ba, 1804 sf, on a 3990 sf lot, with screened porch on the 2nd floor, and ‘plus’ detached space. April 18 - Perfect weather in A-town today! April 11 - “Thank you for helping me to realize that online house hunting is..